you are here: Home » News » Refurbished Kindles – Deal or No Deal? Refurbished Kindles – Deal or No Deal? Crave, the gadget blog at CNET, has an interesting post about the refurbished 2nd generation Kindles that Amazon is selling and whether or not they are worth the price. Amazon has the refurbished 6-inch Kindle priced at $159 and the Kindle DX at $289. Their verdict for the 6-inch model is that, at $159, it’s probably not a good deal. You can get a brand new Kindle 3 for $139 (Wi-Fi only, but still cheaper than the refurb). 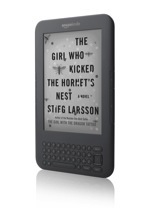 As for the Kindle DX, the answer isn’t as clear. A new Kindle DX will run you $379, so the refurbished DX will definitely save you some money. The design essentially stayed the same from the old to the new generation, although the new model does have a higher contrast screen. I guess you really need to weigh the advantage of a better screen against saving $90. If you’re interested in purchasing a refurbished Kindle, check out the discussion over at Crave where readers are answering the question, Deal or No Deal?